The purpose of this article is two-fold in nature as I attempt to help the reader understand what Latter Day Saints mean when they referring to LDS doctrinal sources as either “official” or as “unofficial”. This frequently comes up in discussions that LDS Church members have with non-members or "investigators" of their religion. Because of my own experiences in dealing with LDS missionaries and other members of the church and having this phrase repeatedly brought up, I have discovered that the Mormons are trying to have their proverbial cake and eat it too. As I began to research this project, I came across very little information on the subject, although I knew full well what the LDS church accepts as inspired and official material. My prayer and hope for the reader is that he or she will gain a far better understanding of the word games that are used by the LDS members to avoid discussion of their lesser known yet controversial teachings. This is important because even the prophets of the LDS church have promised us that whatever they say will not lead people astray. I wish to now recount an experience of mine that sparked my interest in this topic. I was asked to meet with a personal friend of mine in Atlanta who had already had around 5 to 6 visits with LDS missionaries and was not having much luck in trying to get them to see where my friend was coming from as a believer. Before I went, I photo copied literally hundreds of papers and books and other works that were solely produced by the LDS Church as vehicles of doctrine and practice: when I quoted from them, it would be the citing of doctrinal teachings produced entirely by their own leaders and prophets that would clarify the differences between orthodox Christian teaching and erroneous LDS teaching. 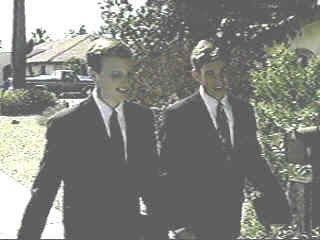 When these two young men tried to teach me the gospel of Mormonism, they seemingly had no problem at all quoting unofficial church material to me. This is done on a grand scale by every missionary I have talked to. After about 30 minutes, I decided to ask them about some controversial questions and teachings that were made by Joseph Smith and Brigham Young and are recorded in LDS sermons and early church lectures. One of the best sources for these is the LDS Journal of Discourses (JOD) because in those volumes of writings, such statements as the "Adam-God doctrine" brought forth by Brigham Young, as well as other teachings about our Lord being married at the wedding feast as recorded in John 2, Jesus having children and being a polygamist as well can be located. The missionaries will never bring up these issues with potential converts. I don’t blame them either. But, because they claim to be representing the "one true church", as was Brigham Young at the time, I decided to ask them about these sermons recorded by their church. Immediately, I was accused of promoting “yellow journalism”. I can assume that this accusation is made because what I quoted was not in the lesson plan they had intended for us. They also accused me of reading too much "anti-Mormon material" as well. This problem was overcome by the fact that I had copied pages right out of the JOD that their church produced! If it was indeed “yellow journalism” and “anti-Mormon”, it was the LDS who was to blame. After a while of going around and around with them, they finally fell back upon the typical LDS response to those confronted by LDS doctrinal sources: whatever I quoted was not considered official by the church and for that reason, they were free to not believe it. Another way of putting it is that they claim freedom from being bound doctrinally by anything stated that they would not consider "official material." They claim, as do many LDS Church members today, that the JOD is merely a collection of church talks from the past that were never considered to be one of "the standard works" that define doctrine and practice - therefore, they were not "official" sources of church teaching. In spite of their claims, let's now look at how early LDS members viewed the Journal Of Discourses. The JOD is a 26 volume compilation of LDS sermons delivered by early church presidents and prophets, covering about 35 years. There were several men who were officially assigned by the LDS Church to record the talks. Volume One of the series contains a letter from the LDS First Presidency (Brigham Young, Heber C. Kimball and Willard Richards), dated June 1, 1853, authorizing the publishing of the sermons and requesting that all LDS Church members "co-operation" by purchasing and selling them (scanned reproduction here) as a work of "mutual benefit". Essentials in Church History, by Joseph Fielding Smith, published by the LDS Church, p.674. Deseret News 1989-90 Church Almanac, p.188, published by an LDS Church owned business. Doctrines of the Gospel, Student Manual, Religion 231 and 232, published by the LDS Church Educational System, 1986, p. 83. Ensign Magazine (official publication of the LDS Church) May 1996, conference talk by James E. Faust, of the First Presidency, p.7. Ensign Magazine, May, 1999 p. 81, Bishop Keith McMullin quoted from the J&D in the April 1999 LDS Conference. As we have seen, it is inconsistent for Latter Day Saints to question the accuracy of the JOD while their leaders continue to quote from them. In all of these accounts, there was never a disclaimer about the accuracy of the account. This is a double standard that Mormons are consistent in using. They are always considered "unofficial" when something is quoted they are embarrassed about. In addition to the four standard works considered "official" (the Bible, the Book of Mormon, the Doctrine & Covenants and the Pearl Of Great Price) by the LDS Church, the "inspired" words of their living prophets are also considered as official scripture, and are conveyed to the LDS membership through the use of publications formally disseminated at various levels of the Church's leadership structure. In light of the glaring contradictions above, one is left to wonder how anything is ever considered official belief by the LDS church. This is surprising because all these men claim to speak for God and the one true church, but the historical record clearly shows they have all at one time or another contradicted all others who were leaders or prophets. So far we have seen that even when something is considered official by the church, someone can and often does come along and state that whatever was said previously is no longer to be believed. This is why it is hard to ever nail them down on anything because each member has his or her own definition of what is to be believed. Now that we have laid the groundwork in explaining the problem of LDS double-talk, let us now turn our attention to the task of finding out how we or even the Mormons should determine truth. In light of this, how are Mormons to sort out their theology? What about continuing revelation that contradicts previous revelation? This is the very fabric that runs throughout the LDS Church and the missionaries only repeat these same glaring inconsistencies. In conclusion, we must say that it is irrelevant to say that these teachings should not be given serious consideration because they are not in the standard works. I have often asked Mormon missionaries if these men were telling the truth or not when they spoke either officially or unofficially. If they were telling the truth, it doesn’t matter if its not found in the standard works. If they were not telling the truth, why should I believe anything they say or admit that they are speaking on God’s behalf? Remember that most LDS missionaries are not accustomed to having these concepts brought forth by someone outside the church. The Christian does not have this predicament because he accepts the Bible as the final word of God in all matters of faith and practice. Our beliefs do not change with each new church leader, but rather we are grounded in the fact that God spoke through holy men in times past and we have the confidence that God is the same yesterday and forever and He does not change. (2) Articles of Faith, 1982 ed, 1:9. ????? (3) Encyclopedia of Mormonism, Vol. 3, p. ???? (4) Defense of the Faith and the Saints, Vol. 2, p. 458. (5) Answers to Gospel Questions, Vol. 2, p. 113-114. 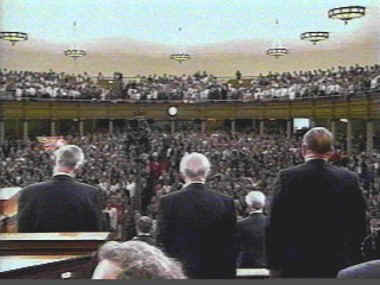 (6) The First Area General Conference for Germany, Austria, Holland, Italy, Switzerland, France, Belgium, and Spain of the Church of Jesus Christ of Latter-Day Saints, Munich Germany, August 24-26, 1973, with Reports and Discourses, p. ????. (7) ????? Autumn 1982 quoted from Peter Crawley. (10) Articles of Faith, 1982 ed., p. 7. ??? ?